Dr. Akbar is the Medical Director of Radiology, Rush Copley Medical Center, Aurora, IL; Dr. Jafri is Head of Genitourinary Radiology, and Dr. Wiater is a Staff Radiology, Department of Diagnostic Radiology, William Beaumont Hospital, Royal Oak, MI; Dr. Amendola is Head of Genitourinary Radiology, University of Miami, Miami, FL. The kidney can be affected by numerous chronic and acute inflammatory processes that may be infectious or autoimmune. Infections include viral, bacterial, or fungal disease. This review will specifically address acquired immunodeficiency syndrome (AIDS) nephropathy, acute and chronic pyelonephritis, renal and perirenal abscess, emphysematous pyelonephritis, emphysematous pyelitis, malacoplakia, diffuse and focalxanthogranulomatous pyelonephritis, fungal infections, tuberculosis (TB), and replacement lipomatosis. The authors will review multimodality imaging findings and pitfalls of renal inflammatory diseases. 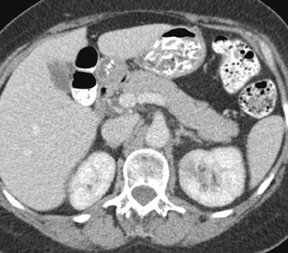 Radiographic findings include uniform renal enlargement, diminished nephrographic density, delayed calycealopacification, diminished calyceal contrast density, and attenuated and distended pyelocalyceal structures. 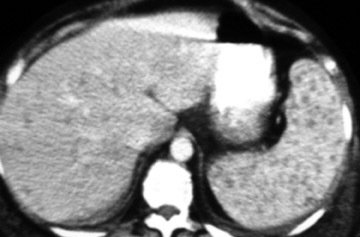 Rarely, focal calyceal compression may be seen. Dilatation of the collecting system and nodular edema of the pelvis or infundibulum are also reported. A striated nephrogram is a relatively common presentation (Figure 1). 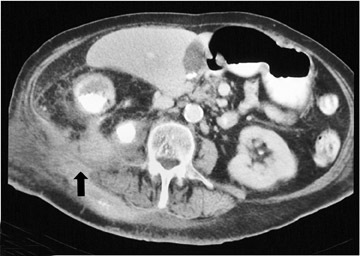 Acute focal bacterial pyelonephritis (AFBP) is seen in uncomplicated cases of APN. With medical therapy, most inflammatory masses resolve within in a few weeks without subsequent renal damage. Scarring is uncommon in uncomplicated cases in the absence of comorbid conditions. 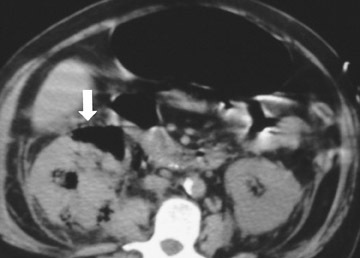 Severe diffuse bacterial nephritis may produce permanent damage such as papillary necrosis or global atrophy. 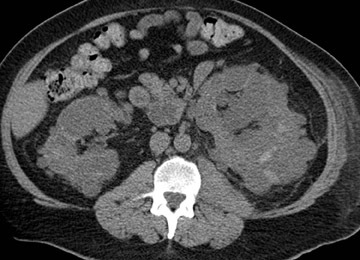 The Society of Uroradiology recommends that all patients with renal infection be referred to as having APN. Additional modifiers to better describe the inflammatory process include unilateral or bilateral, focal or diffuse, and with or without focal swelling or renal enlargement. Dimer captosuccinic acid (DMSA) technetium-99m ( 99m Tc) scintigraphy is both a highly sensitive (92%) and specific (93%) diagnostic study. Single-photon-emission computed tomography (SPECT) imaging has an even higher sensitivity, at 90%. 4 Dimer captosuccinic acid 99m Tc is more sensitive to the presence of renal scarring compared with IV urography (IVU) or ultrasound. Dimer captosuccinic acid accumulates in the proximal tubular cells. Cortical uptake depends on blood flow and cell membrane transport. In APN, low uptake is attributed to locally reduced renal blood flow (RBF) and/or a disturbed flow mechanism. The reduced RBF is secondary to intravascular granulocyte aggregation leading to arteriolar or capillary occlusion. Renal cortical defects present at 6-month follow-up have a high rate of ultimate resolution. It has been shown that DMSA 99m Tc scintigraphy performed 12 months after infection provides more reliable data regarding persistence of renal cortical lesions 5 (Figure 2). Ultrasound is not very sensitive in early or uncomplicated cases, and is less sensitive than CT and DMSA 99m Tc scans. Findings include renal enlargement and focal hypo- or hyper echoic zones of parenchyma. In children, ultrasound is useful as a screening examination to evaluate for hydronephrosis, megaureter, and renal ectopia. 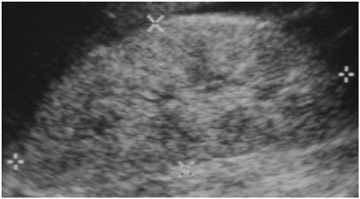 Harmonic imaging with speckle reduction has the potential to increase ultrasound sensitivity for the diagnosis of pyelonephritis. Power Doppler may detect decreased flow in edematous areas and has the potential for identifying APN in children. In view of its low accuracy, however, Power Doppler is unlikely to replace DMSA 99m Tc scanning. The use of contrast-enhanced ultrasound can improve APN diagnosis and reduce interobserver variability 6-8 (Figure 3). 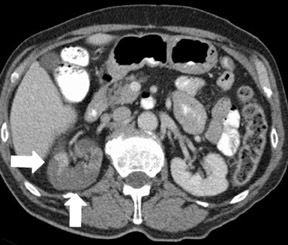 Computed tomography (CT) is considered the modality of choice in the evaluation of patients with acute bacterial pyelonephritis. Recently, CT urography has been increasingly used in place of IVU. 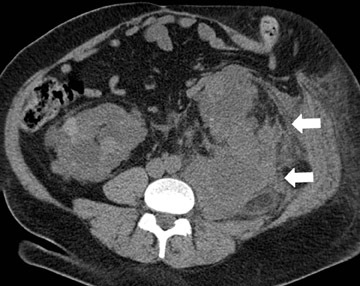 Unenhanced CT can detect calculi, gas formation, renal enlargement, hemorrhage, parenchymal calcification, obstruction, and inflammatory masses. 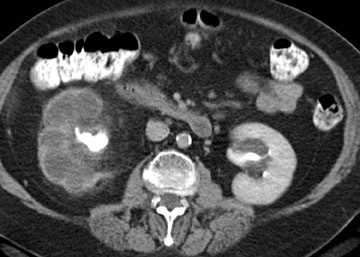 In many cases, unenhanced CT will appear normal and contrast-enhanced scans must be performed. The nephrogram phase is considered to be superior in depicting the full extent of lesions and, in general, defines the abnormalities of APN. 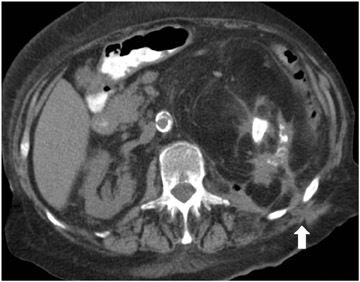 Dual-phase CT with pre- and postcontrast-enhanced scanning in the nephrographic phase at 70 to 90 seconds isadequate for the diagnosis. The delayed phase is indicated only if obstruction is suspected. 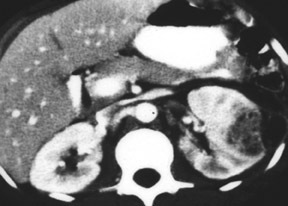 CT findings include perinephric abnormalities, alteration of renal contour, and parenchymal wedge-shaped areas of decreased attenuation radiating from the papilla to the cortical surface. The striated areas are thought to be due to tubular obstruction secondary to edema with intervening normal tubules. The striated nephrogram have a lobar distribution and may be unifocal or multifocal. Calyceal effacement and pelvicalyceal wall thickening may also be seen. Multidetector CT with multiplanar reformation allows the depiction of the kidneys, ureters, and bladder in a single breathhold. This approach can potentially help in planning image-guided drainage procedures if there is an indication of a renal or perirenal abscess (Figure 4). Magnetic resonance imaging (MRI) may be helpful in differentiating acute from chronic parenchymal defects. In addition, it can potentially be applied in patients who are pregnant, and, until recently, has been a potential alternative in patients with known renal failure (especially diabetic patients). Reports of nephrogenic systemic fibrosis (NSF) in patients with renal failure who were exposed to gadoliniun have limited the use of contrast-enhanced MRI as an alternative. In general, however, MRI is reserved as a problem-solving modality or is used under such circumstancesin which other imaging studies are either contraindicated or have equivocal findings. 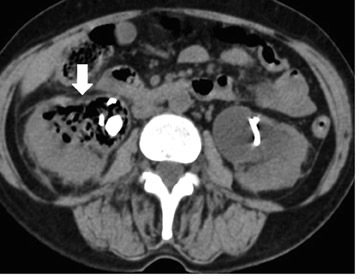 Delayed recognition or inadequate treatment of APN can progress to the development of small focal abscesses that can then coalesce to form larger fluid collections. 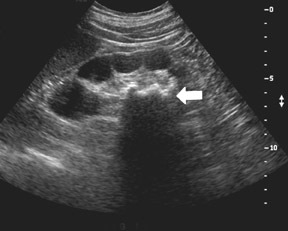 Perinephric abscesses may develop secondary to rupture into the perirenal space or secondary to parenchymal necrosis. They are usually contained within Gerota's fascia. The overall prevalence of renal scar is approximately 30% in patients who develop renal abscesses. 3 In fact, the prevalence of scar is highest in patients who develop abscesses, followed by lesions with liquefaction, and lowest in those with "simple" lesions (Figure 5). Suppurative pyelonephritis (SPN) is a severe form of APN. This is a different entity from pyonephrosis and xantho granulomatouspyelonephritis (XGP). There is no predisposition to develop SPN in a hydronephrotic kidney. Septicemia related to IV drug abuse and skin infections are other causes of renal abscesses that are usually caused by Staphylococcus . 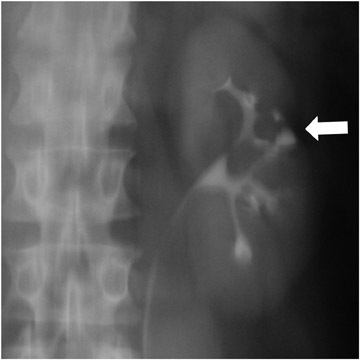 Super infection of a renal cyst or diverticulum may simulate a renal abscess. 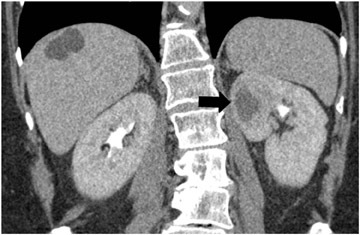 Patients with autosomal dominant polycystic kidney disease or acquired cystic disease from dialysis may develop renal abscesses if a cyst becomes infected (Figure 6). 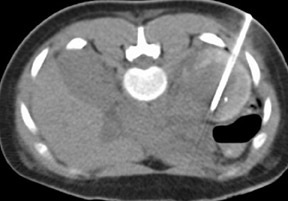 Percutaneous aspiration or drainage provides optimal nonoperative diagnosis and therapy (Figure 7). Xanthogranulomatous pyelonephritis is a severe form of renal parenchymal inflammation that occurs in the presence of chronic obstruction and suppuration. The name is derived from the yellow (xantho) color seen on gross pathology and the granulomatous reaction seen histologically. The characteristic features are replacement of normal renal parenchyma by multiple fluid-filled cavities arranged in a hydronephrotic pattern. Typically, patients are middle-aged women with a mean age of 44 to 50 years. This condition is almost always unilateral. Common signs and symptoms include malaise, fever, weight loss, flank pain and palpable mass. Laboratory results show leukocytosis, anemia, pyuria, hematuria, and positive urine culture. Pediatric XGP has a greater propensity for focal disease and a lower predilection for females. If lipid-laden macrophages are absent histologically, the process represents pyonephrosis. Xanthogranulomatous pyelonephritis is always unilateral, may befocal (17% of cases) or diffuse, and does not occur with increased incidence in diabetic (10%) or AIDS patients. Proteus mirabilis and E coli have been reported as the most common organisms associated with XGP, but a sterile urine culture is not uncommon. Urinary tract infection, previous ineffective antibiotic therapy, chronic renal ischemia, abnormalities in lipid metabolism, lymphatic blockage, and impaired immunity have been suggested as etiologic factors. Coexistence of XGP and renal replacement lipomatosisas well as XGP with renal TB has been reported. 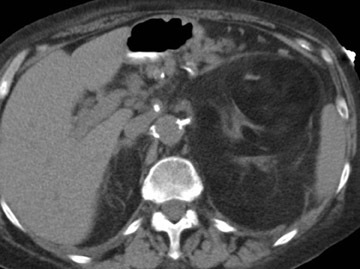 CT is the most accurate imaging technique for the diagnosis of XGP. 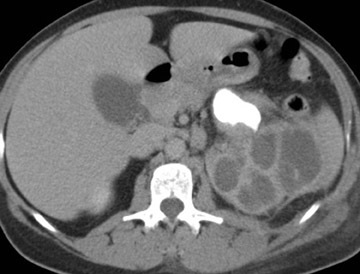 CT findings of XGP include an enlarged kidney with a reniform shape, poor or absent excretion of contrast media, and replacement of renal parenchyma with multiple low-density fluid-filled areas arranged in a hydronephrotic pattern. A rim of tissue surrounding the fluid-filled cavities may be seen on postenhanced images. This represents normal parenchyma and/or an inflammatory process. There is potential for spread of the disease beyond the kidney into the peri- and pararenal space (Figure 8). A staghorn calculus is a common XGP feature but is absent in 20% of cases. Rarely, air is seen in the renal parenchyma. Typically, perinephric stranding and thickening of Gerota's fascia is seen. Xanthogranulomatous pyelonephritis has also been called "the great imitator" because its clinical and radiological findings closely resemble other pathologic conditions such as pyelonephritis with stones, renal tuberculosis, perinephric abscess, and adenocarcinoma. 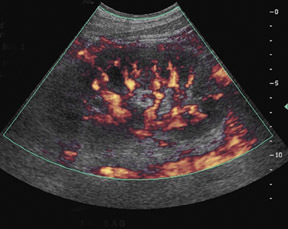 Ultrasound of XGP shows an enlarged kidney, central echogenic foci, and multiple anechoic or hypoechoic areas with a staghorn calculus. 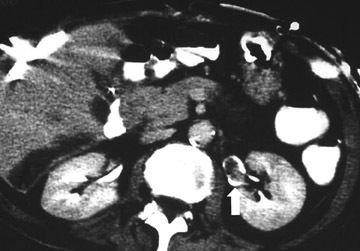 Associated complications (such as psoas abscess, nephrocutaneous fistula, renocolonic fistula, and paranephric abscess) can be observed, as shown in Figure 8. Complications observed in the postoperative period include bowel fistulas, draining sinuses, and delayed wound healing 9,10 (Figure 8). 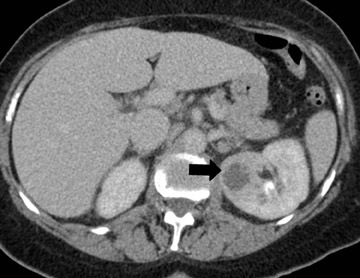 Emphysematous pyelonephritis (EPN) is an acute, often fatal, necrotizing infection that is characterized by gas formation in and around the kidney. Gas-forming bacteria using glucose as a substrate cause necrotizing lesions in affected tissue. Emphysematous pyelonephritis is seen in patients with poorly controlled diabetes (87%) or in those with obstructive urinary tract infection. Obstruction is, however, not a prerequisite of the condition. The condition is twice as prevalent in women. Patients present with chills, fever, flank pain, lethargy, and confusion. Associated organisms include E coli, Klebsiella pneumoniae, Aerobacter aerogenes, and P mirabilis . 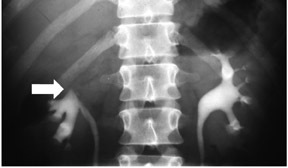 Radiography and IVU show a mottled gas pattern with absence of excretion. On ultrasound, dense echoes are seen within the renal parenchyma that may produce the "gassed-out kidney." CT is needed to assess gas distribution 11 (Figure 9, Table 1). Pyonephrosia is a suppurative infection in an obstructed collecting system. The spectrum ranges from recently infected hydronephrosis to an end-stage nonfunctional kidney filled with pus. More than 50% of patients have calculus formation. Xanthoma cells are absent. Intravenous urography and retrograde pyelography (RGP) may show fragmentation of a staghorn calculus, which is also suggestive of XGP. The renal outline may be obscured if there is perinephric extension. If the kidney is nonfunctioning, RGP may reveal the presence, site, and source of obstruction. Contrast may mix with the purulent contents, and the hydronephrotic kidney may appear distended with stringy and particulate filling defects. 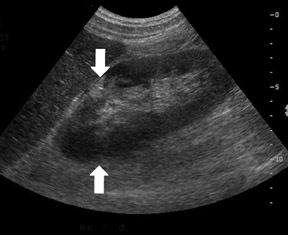 Ultrasound shows moderate-to-marked hydronephrosis and echogenic shadowing calculi. 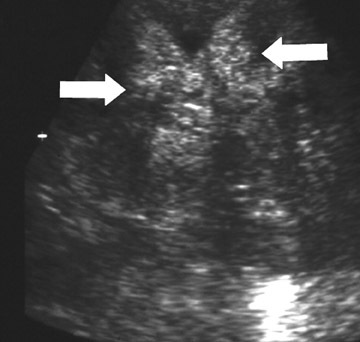 The collecting system may appear echogenic because of the presence of pus and debris. 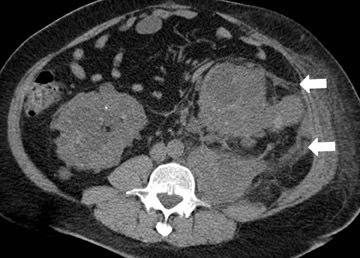 CT findings are nonspecific. 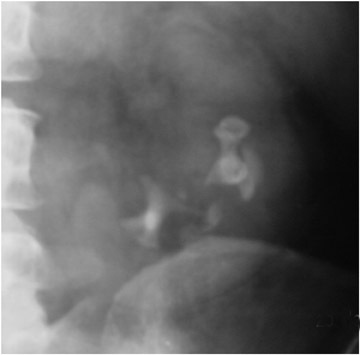 Hydronephrosis with high-density urine, calculi, or gas in the collecting system may be seen. 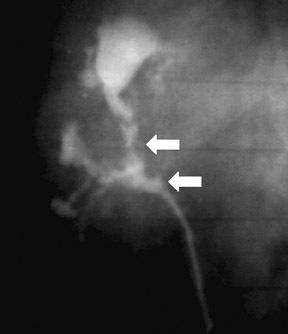 Thickening of the wall of the renal pelvis may be seen, with perinephric stranding also commonly present 13 (Figure 10). The most common etiology of chronic inflammation in children is reflux. Adults may develop chronic inflammation following severe APN pyelonephritis, particularly in diabetic patients. Other predisposing factors include obstruction, calculi, and foreign bodies. Chronic inflammatory change may be unilateral or bilateral, asymmetrical, or segmental with a scar seen overlying a blunted calyx (Figure 11). Since scars may mimic angiomyolipomas, excretory phase imaging is often used to determine the correct diagnosis. Renal replacement lipomatosis (RRL), also known as replacement fibrolipomatosis, develops from chronic pyelonephritis. The true pathogenesis is, however, unknown. It is commonly seen as a unilateral process, but bilateral involvement has been reported. Fibrofatty tissue replaces renal parenchyma that has atrophied because of chronic inflammation. The patient may be asymptomatic or may present with chronic inflammation, hydronephrosis, calculi, cutaneous fistula, or a frank abscess and severe renal parenchymal atrophy. Renal calculi (staghorn) are seen in 70% of cases. Pathologically, the kidney is enlarged and has a gross fibrofatty appearance. The renal cortex is extremely atrophic, but a reniform shape is usually maintained. 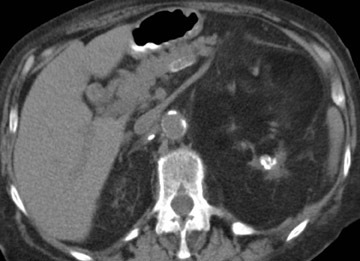 CT is the most definitive diagnostic modality to evaluate the salient features of RRL. Major differential diagnosis includes XGP, renal tuberculosis, and angiomyolipoma or even liposarcoma. Coexisting XGP and tuberculosis with RRL have also been described. Renal replacement lipomatosis has also been reported in a renal transplant 14 (Figure 12). The lifetime risk of renal TB after infection has been reported to be 10%. A recent resurgence has been seen due to the human immunodeficiency virus (HIV)/AIDS epidemic. Approximately 70% of AIDS patients have extrapulmonary TB. In 30% of cases, extrapulmonary TB involves the urogenital tract and occurs mostly in men. It is rare before age 20. Cases of renal TB have also been seen following intravesical Bacillus Calmette-Guerin (BCG) therapy for bladder cancer. Urine culture is the most definitive method of diagnosis. Cultures of multiple early morning urine specimens reveal sterile pyuria, microhematuria, and acidic pH. The pathological triad consists of necrotic debris, caseous-type epithelioidhistiocytes, and Langerhan's giant cells. Both upper and lower poles are often involved. Massive destruction results in autonephrectomy. 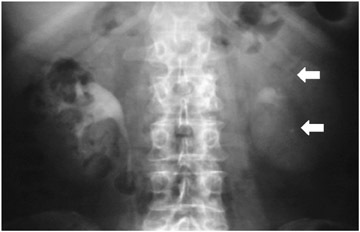 Dystrophic calcifications are seen and may be amorphous, smudged, speckled, curvilinear, lobar, or a combination of the above. The lobar configuration is quite specific for TB. Radiographs show calcification outlining the entire kidney, ureters, and bladder in advanced cases. 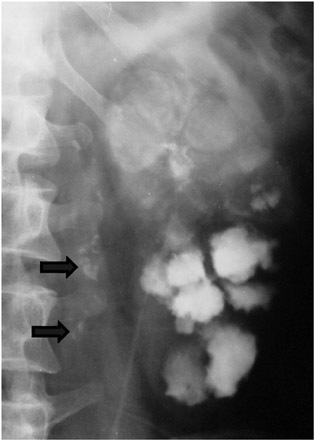 Calcification in the seminal vesicleor vas deferens is suggestive of TB in non- diabetics. 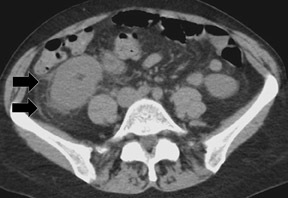 Calcification may also occur in psoas or paraspinal abscesses and in cases of abdominal or pelvic lymphadenopathy. Malacoplakia is a rare granulomatous inflammatory disease that is primarily found in the urinary tract. It frequently occurs in the bladder, kidney, renal pelvis, ureters, prostate, and urethra. A positive urine culture is found in 80% to 90% of cases. Michaelis-Gutmann bodies are the histologic hallmark of the disease. 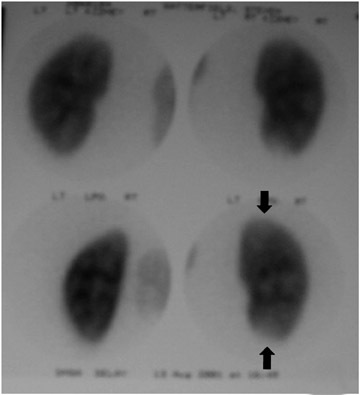 Lesions appear as soft, plaquelike yellow tumor nodules of varying size 18 (Figure 14). Renal candidiasis- At autopsy, the kidney is the most common organ found to be involved following systemic candidemia. Microscopic parenchymal and subcapsular abscesses develop in the cortex. Low-grade infections may show no abnormality. Immunocompromised patients may develop multiple microabscesses, which may calcify when healed. 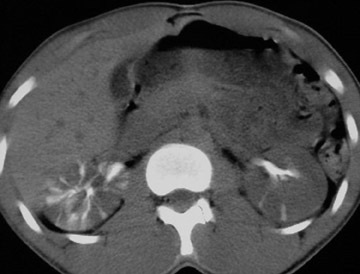 Intravenous urography, ultrasound, and CT findings include papillary necrosis (noted in 21%) and infundibular stenosis. Fungus balls (eg, mycetomas, and urobezoars) can extend down the ureter as casts within the collecting system (seen as the "cat's tail sign"), and this can result in mechanical obstruction. 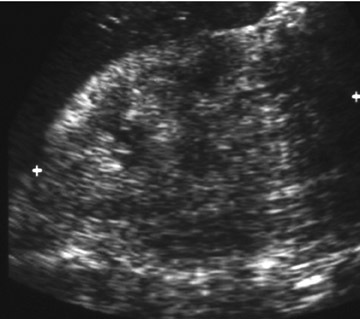 On ultrasound, fungus balls have an echogenic appearance. Fungus balls may resemble other defects and must be differentiated from blood clots, nonopaque calculi, transitional cell cancer, squamous cell cancer, air bubbles, fibroepithelial polyps, cholesteatoma, and leukoplakia 19 (Figure 15). Renal mucormycosis- Renal mucormycosis infection is caused by fungi of the order Mucorales and is uncommon among the HIV population, but is associated with IV drug abuse and a low CD4 count. Intravenous inoculation with spores is believed to contribute to renal dissemination. Clinically, patients have symptoms of pyelonephritis that are unresponsive to therapy. The fungal hyphae aggressively invade blood vessels, leading to hemorrhage, thrombosis, and infarction. An estimated 650,000 to 900,000 residents are currently infected with HIV in the United States. Reportedly, 38% to 60% of AIDS patients exhibit azotemia, proteinuria, hematuria, or pyuria. Clinical findings may range from decreased renal function to full-blown nephrotic syndrome. This condition is more prevalent in males, blacks, and IV drug abusers. The pathogenesis is unknown. No specific treatment is available and HIV nephropathy carries a poor prognosis. Death is often reported within 6 months. An improved survival has been reported with the use of new antiviral treatments. Ultrasound findings of HIV nephropathy include renal enlargement >13 cm in 20% of patients and increased cortical echogenicity, which is largely caused by tubulointerstitial abnormalities, in 75% of patients. This however, is not a universal finding, and a normal sonogram does not exclude HIV nephropathy. There is no correlation between the degree of echogenicity and the severity of renal disease. Thickening of the pelvicalyceal wall may also be seen (this is also seen in reflux and acute tubular necrosis). One should always suspect HIV-associated nephropathy with bilateral increased cortical echogenicity 20 (Figure 16). CT findings of HIV nephropathy include decreased corticomedullary differentiation, decreased renal sinus fat, and parenchymal heterogeneity. 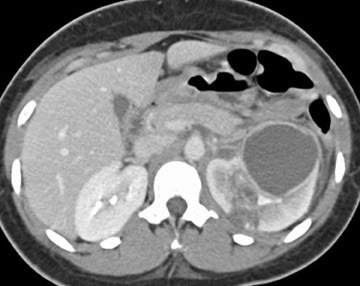 Renal enlargement with a striated nephrogram and a globular renal configuration can also be seen. Pneumocystis carinii pneumonia (PCP) is the most common opportunistic infection in AIDS patients. Chemoprophylaxis is recommended if the CD4+ T lymphocyte count is <200 cells/uL, or there is a history of oral candidiasis or unexplained fever. Risk factorsinclude low CD4 count, history of other infections, PCP pneumonia, and history of aerosolized pentamidine. Radiographic findings include multiple punctate and rimlike calcifications in the spleen, liver, kidneys, lymph nodes, and adrenal glands. A differential diagnosis includes infection with M avium-intercellulare , cytomegalovirus infection, and fungal infections. Individuals infected with HIV are at substantial risk for TB. Extrapulmonary TB is common at any stage and populations at increased risk include IV drug abusers, blacks, Hispanics, and Haitians. Sterile pyuria is seen, and urographic manifestations are similar to those in non-AIDS patients. Abscesses may be seen in multiple locations. Tuberculosis may affect the epidydimis with enlargement and hyperechogenicity and the testes with enlargement and hypoechogenicity. A gallium scan may be of help in localizing sites of involvement. 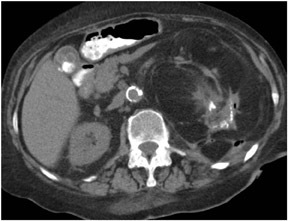 Most patients with acute pyelonephritis do not require any diagnostic imaging procedures. However, further work-up may be necessary in patients with recurrent infections or chronic illness or in symptomatic individuals in whom urinary tract infection cannot be documented. A variety of imaging studies will detect morphologic and functional changes of the kidney in response to inflammation. Selection and interpretation of these imaging modalities requires knowledge of the clinical and radiologic manifestations of infection, including pitfalls in diagnosis. Renal infections: An update. Appl Radiol.